Delicious holiday meals are a railroad tradition, providing passengers a taste of home even when they are traveling the rails. The Amtrak Archives contains a specially printed menu, probably from the 1970s, that provides a glimpse into a typical Thanksgiving meal served on-board in that era. For the entrée, passengers could choose between native Tom turkey with apple-pecan stuffing or baked sugar-cured ham with raisin sauce and candied yams. Pumpkin pie Chantilly made for a classic holiday dessert. The paper menu features a decorative background incorporating a pilgrim hat, pumpkin, multicolor flint corn and fall harvest fruits. 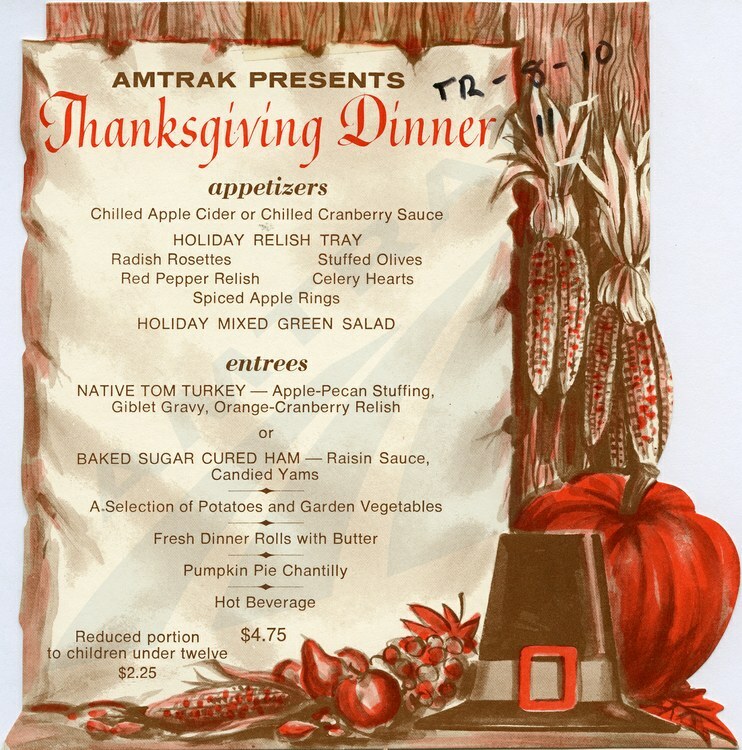 At the time this menu was printed, long-distance passengers probably enjoyed their Thanksgiving meal in a Heritage Fleet Dining car such as the one depicted in the postcard below. When Amtrak took over most of the nation's intercity passenger rail services in 1971, the company purchased and leased locomotives and rolling stock from the predecessor railroads. The Dining car in this image retains the interior décor—delicate songbirds and a trellised ceiling— installed by its previous owner. By 1979, new Superliner equipment began replacing Heritage Dining cars on western trains, but in the East, units were refurbished and remain in use today. New single-level long-distance cars being built by CAF USA will allow for the retirement of the oldest Dining cars within the next few years. Until it could order its own china pattern, Amtrak used pieces from the Santa Fe Railway and other former passenger railroads. The blue sugar bowl and bud vase on the table were part of an early set of serving pieces made for Amtrak by the Hall China Company of Ohio that also included teapots, coffeepots, creamers and pitchers. Referred to as the “Amtrak National” pattern, they have a medium blue glaze and are noted for their angular handles. Other china used in Amtrak's first decade included plates and bowls manufactured by the Mayer China Company and then the Homer Laughlin Company; they have a white base with a blue rim. Today, Amtrak still offers long-distance passengers a Thanksgiving feast. The traditional meal includes sliced turkey breast with stuffing and gravy, as well as sides of three grain rice and cranberry sauce. To finish on a sweet note, diners may choose between gelato, sorbet or cake. Never eaten on a long-distance train? Check out the Amtrak Blog for some useful tips and advice. From all of us at Amtrak, we wish you and yours a Happy Thanksgiving!